(Morning Star News) – A Christian in Chiapas state, Mexico was summarily jailed for three days the evening of Jan. 7 for refusing to deny his faith and contribute to Traditionalist Catholic festivals, according to an advocacy group. Local authorities who practice the Traditionalist Catholic blend of indigenous pagan and Roman Catholic rituals also threatened Juan Gabriel Lopez Perez, 28, that he would not be released unless he sold his house and left the area within 20 days, the Coordination of Christian Organizations (COC) said in a statement. When Lopez Perez fell ill two days into his 72-hour sentence and was temporarily released to obtain medical care, his wife was obliged to serve the time in jail in his place, according to the organization. Authorities in Rancheria El Encanto, Municipality of Las Margaritas, had given Lopez Perez the option of paying a 5,000-peso (US$240) fine or 72 hours in jail. After refusing to pay the fine, he was sent to jail at 7 p.m. for declining to sign a document denying his evangelical faith and agreeing to contribute to the Traditionalist Catholic festivals, which frequently involve drunkenness. (Agenzia Fides) – Diocesan priest José Luis Sánchez Ruiz, who had been kidnapped on Friday, November 11, was released yesterday with “obvious signs of torture”, according to a statement from the Diocese of San Andres Tuxtla (Veracruz, Mexico) signed by His Exc. Mgr. Fidencio Lopez Plaza. In the statement, sent to Fides, the Bishop thanked the authorities for their interest and informs that the community awaits the conclusions of the prosecutor to clarify the facts. Mgr. Lopez Plaza also thanks for the “heartfelt sympathy and prayers of all the faithful, as well as the Mexican Episcopal Conference, and in particular the Bishops of the Ecclesiastical Province of Veracruz”. Poza Rica (Agenzia Fides) – In a statement the Mexican diocese of Papantla confirmed the violent death of two priests: Fr. Alejo Nabor Jiménez Juárez and José Alfredo Suárez de la Cruz. According to information gathered by Agenzia Fides, a first report of the Office of the Attorney General of Veracruz state indicates that the two priests were kidnapped last Sunday evening, September 18, from the parish of Nuestra Senora de Fatima, in the extreme outskirts of the city of Poza Rica, in the northern part of the Veracruz state. Their lifeless bodies were found yesterday morning, Monday, September 19, at the side of the road that connects Papantla to Poza Rica. A collaborator of the priests, who worked as a sacristan and driver, was also kidnapped, and fortunately was found alive. The area was the scene of violent clashes between drug cartels for years, but it is still not clear why the two priests were killed. 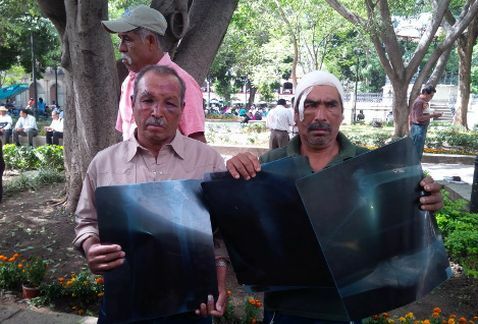 Christian Solidarity Worldwide (CSW) is calling on the Mexican government to prosecute local officials responsible for the unjust imprisonment and torture of four protestant Christians from 5-8 November in the western state of Oaxaca. Reverend Leopoldo Alonso, leader of the Independent Pentecostal Christian Church in San Juan Ozolotepec, and three members of his church, Manuel Martínez Silva, Miguel Silva Reyes and Plácido Aragón, were imprisoned on 5 November on the orders of the municipal president, who had ordered the destruction of the Pentecostal church on 4 November. The four men were freed on 8 November after government officials, accompanied by state police, travelled to the municipality to intervene. Voice of the Persecuted viewed photos of the men who were admitted to the local hospital that clearly showed signs that they had been severely beaten. Threats against the Protestants were first reported in May when church members made a public declaration calling for state government intervention in reaction to threats from the municipal president, Pedro Cruz González. The church members said that Cruz González had threatened to burn them and throw their bodies into a canyon if they did not renounce their faith. When government officials failed to respond, the situation escalated. In July, a member of the church, Vicente Aragon Hernandez, was imprisoned by Cruz Gonzalez. Municipal leaders indicated that this was punishment for speaking out publicly about the situation in San Juan Ozolotepec. In the face of continued inaction on the part of the state government, the situation took a violent turn when Cruz Gonzalez made a public order to ‘demolish the temple, lynch, imprison and torture’ the members of the Pentecostal church. The National Commission for Human Rights has opened a complaint into the San Juan Ozolotepec case and issued a statement indicating that cases of religious intolerance are on the rise in Mexico, particularly in rural areas and regions with a significant indigenous population.